Facing charges: Sister Patricia Fox, superior of the Sisters of Our Lady of Sion in the Philippines, speaks to the media after her April 17 release from the Bureau of Immigration headquarters in Manila. Philippine authorities arrested the 71-year-old Australian nun for allegedly engaging in illegal political activities. Photo: CNS/Romeo Ranoco, Reuters. 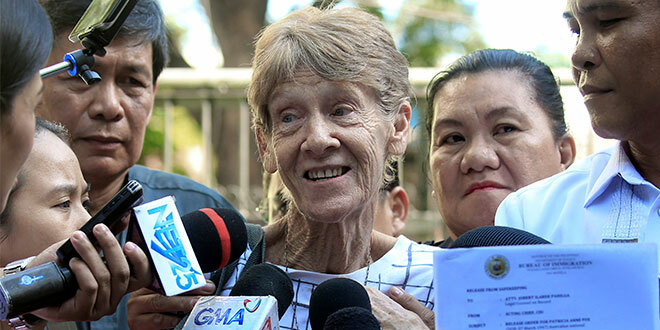 The Philippines Government has ordered Sr Patricia Fox to leave the mainly Catholic southeast Asian country within 30 days after immigration authorities revoked her missionary visa for joining protest rallies. The immigration bureau has demanded Sr Fox leave the Philippines after “she was found to have engaged in activities that are not allowed under the terms and conditions of her visa”. Sr Fox, co-founder and superior of the Our Lady of Sion order in the Philippines, has been in the country for more than 27 years, but now has 30 days to exit. Her renewable missionary visa, which was due to expire in September, was cancelled on Monday April 23, but she will be allowed to return to the Philippines as a tourist, not as a missionary. THE 71-year-old Australian missionary nun accused of “illegal political activities” and facing deportation in the Philippines says “it’s all a shock – there’s a real attack on Church people, standing by the poor and speaking out”. “So I think I’m the meat in the sandwich here,” Sr Patricia Fox said from her mission house in Quezon City, as she faced an investigation into her activities as part of an international fact-finding mission probing the killings and human rights violations against farmers. Sr Fox, originally from Melbourne where she practised law, co-founded the Congregation of Our Lady of Sion in the Philippines 27 years ago, and is known as a tireless defender of Filipino farmers and their human rights. She was arrested on April 16 and held for a night in Bureau of Immigration detention. She was released, but is under ongoing investigation and faces being deported within days after President Rodrigo Duterte singled her out and accused her of bad-mouthing his administration – an apparent move to silence dissident voices including those of human rights activists. “You do not have that right to criticise us. Do not insult my country. We never did that to Australia,” President Duterte said in an extraordinary attack on a frail religious sister. Sr Fox knows that her life’s work as a missionary in the Philippines is now on the line, however she strongly refuted Bureau of Immigration claims that she had engaged in political activities and anti-government demonstrations. “I’ve been saying I don’t speak at rallies. And they’ve got a photo of me holding a microphone,” she said. Sr Fox said she recently embarked on a fact-finding mission in the southern island of Mindanao and attended a rally of Coca-Cola workers who had been sacked after eight years as contract labourers. “They asked me to say something at the rally. I thought about it six times, and eventually said how I felt for them – that the Catholic Church teachings were clear on the right to unionise, the right to security of tenure, the right to a just wage, so that they should manage to get their jobs back,” she said. Sr Fox said investigators were also looking into a rally incident that took place in Hacienda Luisita in 2013, while she was on a fact-finding mission. “All of a sudden the police started arresting people. Well, I went along with the ones they were arresting, to make sure they were okay and not treated badly. And I stayed with them,” she said. As Sr Fox awaits the outcome of an investigation she is calling on Australian Catholics to help the cause of human rights by “become aware” of exploitation going on in the Philippines. “What I would really like is for the Australian people to know what is going on here,” she said. “As religious, or even human beings, when you see farmers and workers slaving away and (they) still can’t feed their families you have to ask why. Sr Fox said many Australian companies operated in the Philippines, and that unrestricted mining and agricultural practices were causing worsening landslides and flooding. “Become aware, and then act,” Sr Fox urged concerned Catholics. There are global pledges of support for her. Her confrere in Rome, Italy, has appealed to the Philippine Government to spare her from possible deportation “for helping those in need at the peripheries of society”. Similarly, the Sisters of Our Lady of Sion in Australia have condemned the arrest and detention of Fox “without due process and respect for her fundamental rights”. 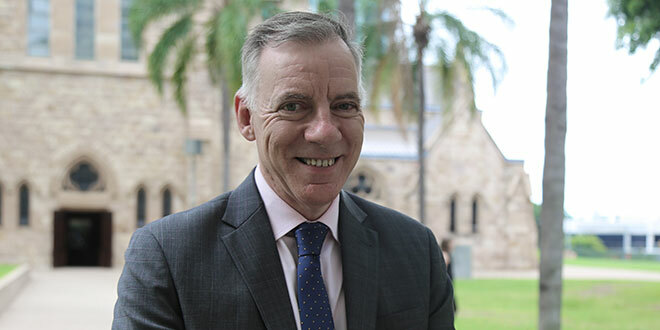 Melbourne Catholic Mission director Kevin Meese, who leads groups of Australian students on emersion projects in the Philippines, said Sr Fox had a strong network of supporters in Australia lobbying behind the scenes on her behalf, both politically and diplomatically. He said the Duterte government had attracted international condemnation for its brutal crackdown on criminal organisations and a “war on drugs”, that had involved thousands of extrajudicial killings and countless human rights violations. “She (Sr Fox) is someone who stands up for the rights of people who are being targeted by the Duterte government, and therefore she puts herself in the way of the campaign against innocent bystanders to the drug war and also the ongoing issue of human rights for indigenous groups and peasant farmers,” he said. Mr Meese cited the case of a retired priest and known human rights advocate Fr Tito Paez, 72, who was gunned down by still unidentified men after he facilitated release of a political prisoner last December. “Anybody who stands in the way of the campaign and can be removed is systematically being removed through murder or deportation. In the case of Fr Tito – murder, in the case of Sr Pat it’s remove her from the scene,” he said. director Kevin Meese. Photo: Mark Bowling.